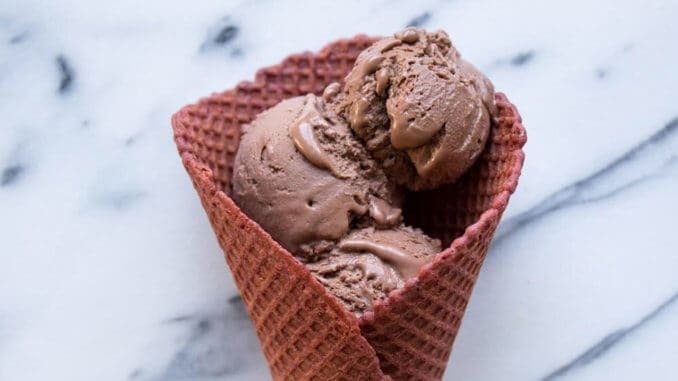 In vegan hotspot Portland Oregon, business tycoons Micah Camden and Matt Lynch are soon to open a ground-breaking ice-cream business called Little Bean. There will be a cart, a truck and a brick and mortar store, but with a difference – this dairy-free dessert is the first to be made from chickpeas. Little Bean have been giving away samples since early August, for consumers to test flavours such as Chipotle Chocolate and Strawberry Sichuan, and in October there are plans for eight unique flavours. The ice creams and additional chickpea-based pastries (created from the pulp by-product from the chickpea milk) are dairy and nut free, and are also high in protein and fibre. The motivation behind the new business was one of dietary issues. He was no longer able to digest dairy ice cream, however took issue with the current market for alternatives; almond milks don’t freeze, coconut milk’s has too strong a flavour, and soy “will never escape the stigma of Monsanto”. When experimenting with chickpeas, he found their milk to be high in protein and fibre, with enough starch for a decent ice cream texture. Little Bean will be open for business in October.